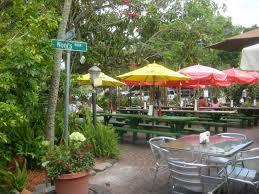 Do you love a good place to eat that has a nice outdoor patio dining area? Chattaway in St. Petersburg has one of the best outdoor dining areas around. Since it is conveniently located off of the Pinellas Trail, it becomes a fantastic place to stop after a nice long bike ride or run, and get a cool refreshing drink, or have a relaxed lunch with friends. This restaurant has been designed to become the destination spot for active individuals during the day, and one of the local hot spots for music outdoors at night. If you fit either profile, or if you just happen to work in St. Pete and want a break from the office at lunch, then this is a great option for you. There are a couple of great factors that go into creating an amazing patio dining experience. In our experience, it was finding the right location that we could turn into the environment we wanted, like creating a wonderful, secret garden sort of experience. Then you have to create some sort of shelter so that your customers don’t get over heated during the day. Finally, you have to determine what sort of food you are going to serve. For us the decision was pretty easy. After creating a unique dining and entertaining environment, we decided that traditional american pub fair was a good solution to help satisfy your cravings.